S. A. Ibrahim, CIU board member and CEO of Radian Group, shared the spotlight with three other prestigious alumni of the University of Pennsylvania’s Wharton School when he received the coveted Joseph Wharton Award at the 44th Annual Wharton DC Award Gala on October 22nd. Co-recipients at the Park Hyatt Hotel gala were Donald Trump, Chairman and President, The Trump Organization, Jennifer Clifford Simpson, Managing Director, The Gladstone Companies, and His Excellency Ron Dermer, Israeli Ambassador to the United States. CIU Board member S.A. Ibrahim (first left) stands shoulder to shoulder with recipients of the 44th Annual Joseph Wharton Award at the Washington D.C. dinner honoring them in October. 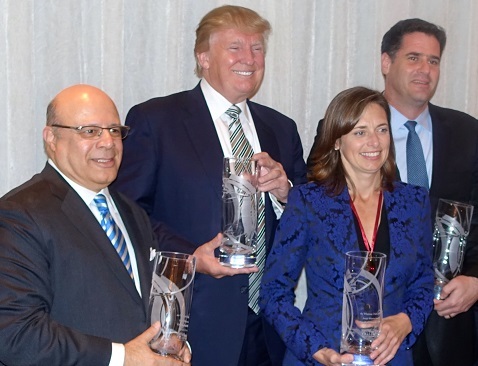 From left: S. A. Ibrahim, CEO and Director, Radian Group; Donald Trump, Chairman and President, The Trump Organization; Jennifer Simpson, Managing Director of the Gladstone Companies, and His Excellency Ron Dermer, Israel’s Ambassador to the U.S.
Honorees excelled in at least one of the following areas; exceptional career achievement, dedication to community and public service, strong connection and support of the Wharton School or the University of Pennsylvania and finally, support of the Wharton Club of DC. In addition to serving on the CIU’s board of directors and actively supporting many of our most innovative initiatives, Mr. Ibrahim is also a board member ofthe Interfaith Youth Core, Chicago, the Philadelphia Anti-Defamation League, and the Auburn (Presbyterian) Seminary, New York. Insofar as exceptional career achievement is concerned, under Mr. Ibrahim’s leadership, Radian has emerged from one of the worst economic and housing related downturns as a market leader. Radian is among the largest private mortgage insurers of U.S. residential mortgages, with a core focus of protecting mortgage lenders from default-related losses. Mr. Ibrahim joined Radian in 2005 and since 2007, the company has doubled its private mortgage insurance market share and written more than $100 billion of high-quality new business. Earlier, while he was the CEO of GreenPoint Mortgage Funding, Novato, CA, he guided the firm in its transformation from a small mortgage originator to one of the leading U.S. companies of its kind.